The Chief Judge of the United States District Court of Guam issued a court order appointing GBB as Receiver to achieve what the Government of Guam was unsuccessful in reaching during the previous 22 years – compliance with the Clean Water Act as set forth in a Consent Decree. What the Judge tasked GBB with, and what the Consent Decree requires, is a complete 180-degree turnaround of a completely dysfunctional solid waste management system while closing a dump that has been open for nearly 70 years. 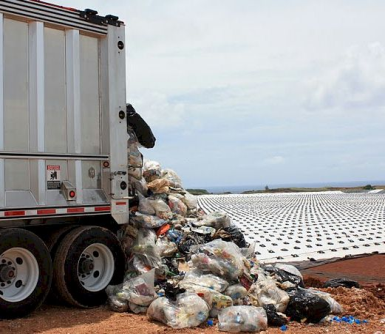 GBB, working with public works, financial departments, the military, private waste haulers, and other stakeholders in Guam, has opened a new landfill and is on a path to comply with all of the terms of the Consent Decree in the most cost-effective and expeditious manner possible. This has been accomplished under the guidance of the Court and in consultation with the U.S. EPA and Guam EPA. Request for bids for construction of the Landfill Operations Road and Mass Grading for Cells 1 and 2. Three bids were received and after careful review, the Receiver awarded a contract. Invitation for Bids (IFB) to procure carts with riveted RFID tags attached and cart lifters to attach to existing trucks, and have these items delivered to a staging area on the Island of Guam. GBB was part of the team that subsequently evaluated the bids received. Request for proposals (RFP) for technical assistance services for the initiation of groundwater quality monitoring activities for the Layon Municipal Solid Waste Landfill. IFB for the construction of Layon Municipal Sanitary Landfill, Entrance Area Facilities, and Cells 1 and 2. Three firms submitted bids and a contract was awarded after careful evaluation of the Receiver. RFP for Construction Management Services for Layon Landfill Systems, Entrance Facilities, and Access Road and Utilities. RFP for a firm to prepare final closure and post-closure plans of the Ordot Dump in compliance with the Consent Decree and RCRA Subtitle D, 40 CFR Part 258. The scope of work includes all of the site investigations and studies needed to support the plans and survey work needed to sort out numerous land ownership issues in the area. 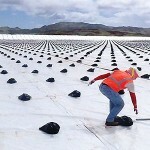 Five firms submitted proposals and the Receiver awarded a contract after a thorough evaluation process. 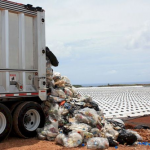 RFP from qualified Operators for services to operate the new Layon Municipal Solid Waste Landfill in compliance with the Consent Decree for seven years, with an option for two five-year extensions. The contract was awarded after a thorough evaluation process managed by GBB. Request for Expressions of Interest to provide a Municipal Solid Waste (MSW) Transfer Station and transportation of MSW from the Transfer Station to the Layon Landfill. RFP for the services of a contractor with demonstrated knowledge and experience in Household Hazardous Waste Facility Operation management. RFP for construction management (CM) services for the construction of Ordot Dump closure systems, wetland restoration, Dero Road improvements and utilities for the Ordot Dump Closure Construction. IFB for the construction of the environmental closure of the Ordot Dump & Dero Road Sewer Improvements. IFB for Contract Processing of Residential Recycling. IFB for the construction of Harmon Residential Transfer Station. IFB for roll-off containers and stationary compactors. 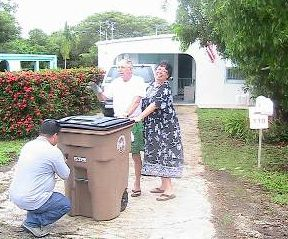 For more information, visit the Receivership website and the Guam Solid Waste Authority’s website.